Habit: Annual to subshrub; monoecious and/or dioecious; occasionally spiny; hairs simple (branched). Leaf: blade simple, alternate or opposite, margins entire or serrate; veins pinnate; stipules 0. Inflorescence: axillary or terminal; 3-flowered cymes in dense spikes, heads or panicles; bracts 0 or 1--5, persistent; bractlets 0--2. Flower: bisexual or unisexual, small, green (+- white), yellow or purple; perianth parts 0 or (1)3--5, free or fused basally, scarious or hardened, persistent; stamens 1--5, opposite perianth parts, free or basally fused as a tube, generally unequal, occasionally alternate with appendages on stamen tubes (pseudostaminodes), anthers 2- or 4-chambered; ovary superior, chamber 1; ovule 1 (2--many); style (0)1--3, stigmas 1--3(5). Fruit: utricle; generally with persistent perianth or bracts. Seed: 1 [2+], small, lenticular to spheric, smooth or dotted to striate or tubercled. Genera In Family: +- 75 genera, 900 species: cosmopolitan, especially disturbed, arid, saline or alkaline soils; some cultivated for food, ornamental; many naturalized, ruderal or agricultural weeds. Note: Amaranthaceae including Chenopodiaceae by some. Polycnemoideae, represented in California by Nitrophila, formerly considered subfamily of Chenopodiaceae, but needs further research. Guilleminea densa (Willd.) Moq. var. aggregata Uline & W.L. Bray is a waif. Froelichia gracilis (Hook.) Moq. possibly naturalized. Habit: Annual (short-lived perennial herb); monoecious or dioecious. Stem: prostrate to erect, branched or not. Leaf: alternate, petioled, ovate to linear, tip often +- notched (2-lobed), midvein ending in sharp point, margin entire, flat or wavy. Inflorescence: 3-flowered cymes, in dense axillary clusters, or large, terminal, panicle- or spike-like inflorescence; bract 1, bractlets 0--2, alike, persistent, spine-like to +- leaf-like or +- membranous, at least margins scarious-membranous. Flower: unisexual. Staminate Flower: perianth parts (2)3--5, scarious; stamens (1)2--5, filaments free; pseudostaminodes 0; anthers 4-chambered. Pistillate Flower: perianth parts (1)3--5, membranous or scarious, free, persistent; ovary ovoid, style 0, stigmas 2--3, persistent, slender, papillate; ovule 1, erect. Fruit: circumscissile or indehiscent, ovoid to obovoid, smooth or +- wrinkled, tip +- gradually (abruptly) narrowed to stigmas or beak; walls thin, membranous. Seed: 1, lenticular to +- spheric, round to obovate, smooth, shiny, occasionally obscure-dotted or -net-like, +- white-ivory to brown-red or black. Species In Genus: +- 70 species: worldwide; weeds, ornamentals, food pls. Etymology: (Greek: unfading, non-withering) Note: Hybrids common, F1 generally with numerous, densely packed bractlets beneath generally sterile pistillate flowers, abnormal-shaped inflorescence with dense, twisted or fan-shaped branches. Unless otherwise noted, descriptions of bracts and flower parts are of pistillate flowers. Unabridged Note: F1 hybrids have been observed in natural conditions or have been experimentally obtained between any of the following species: Amaranthus hybridus, Amaranthus powellii, Amaranthus retroflexus, Amaranthus tuberculatus, Amaranthus palmeri, Amaranthus caudatus, Amaranthus hypochondriacus, Amaranthus cruentus, Amaranthus spinosus, Amaranthus blitoides, Amaranthus albus. Amaranthus caudatus L., Amaranthus cruentus L., Amaranthus hypochondriacus L. frequently cultivated as ornamentals, occasionally escaping from cultivation. Amaranthus spinosus L. probably not naturalized, uncommon waif. Habit: Dioecious. Stem: erect, 20--200(250) cm, branched or not, green, +- glabrous. Leaf: petiole 60--90 mm; blade 15--150 mm, 10--35 mm wide, ovate, rhombic-ovate to lanceolate, base +- wedge-shaped, tip +- obtuse to acute, margins flat. Inflorescence: terminal, simple or panicle-like, +- flexible to drooping, main axis 10--35(50) cm, 1--1.8(2.5) cm wide (including flowers), green; staminate bracts 4--6 mm, >= outer perianth parts, spine-like; pistillate bracts 4--6 mm, 1.3--2 × > perianth, spine-like, lance-ovate. Flower: staminate perianth parts 5, unequal, outer (2.5)3--6 mm, acuminate, spine-tipped, inner 2.5--3 mm, obtuse, notched, stamens 5; pistillate perianth parts 5, unequal, outer 3--4 mm, lanceolate, +- acuminate, inner 1.7--2.5 mm, obovate to spoon-shaped, rounded to +- notched and mucronate; stigmas 2(3), spreading. Fruit: circumscissile; 1.5--2 mm, < perianth, +- spheric to obovoid, brown to occasionally red-brown, smooth or +- rough near tip. Seed: 1--1.4 mm wide, lenticular, elliptic to obovate, dark red-brown to black, smooth, shiny. Chromosomes: 2n=32, 34. 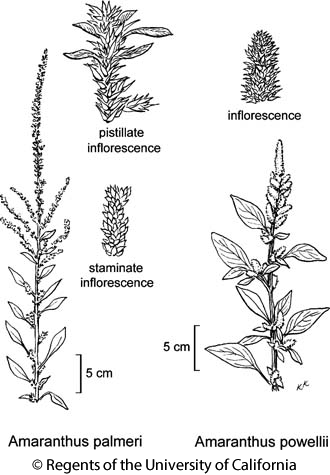 Citation for this treatment: Mihai Costea 2012, Amaranthus palmeri, in Jepson Flora Project (eds.) Jepson eFlora, http://ucjeps.berkeley.edu/eflora/eflora_display.php?tid=12933, accessed on April 20, 2019. GV, CW, SCo, WTR, D; Markers link to CCH specimen records. Yellow markers indicate records that may provide evidence for eFlora range revision or may have georeferencing or identification issues. Purple markers indicate specimens collected from a garden, greenhouse, or other non-wild location.